One of the highlights of the Jungle Theater's stellar 2012 season was the deliciously thrilling Dial M for Murder, about which I wrote "murder shouldn't be this fun." Three of the five members of that cast, along with the director/designer, reunite for this year's thriller Deathtrap. Dial M is a classic from the 1950s, and Deathtrap was written by Ira Levin in the late 1970s as an homage to the thriller genre of which Dial M is a prime example. It's a bit more modern feeling, less tense and more funny, and very meta. Several characters in the play are playwrights who begin to write a play describing their lives, and then continue to act in order to figure out what happens next in the play, in a life imitates art imitates life sort of way. There are several surprising plot twists and turns, including one moment so shocking that there was a cry of fear and delight throughout the audience such as I've never heard before inside a theater. The audience reaction was almost as much fun as what was going on onstage. I really don't want to give away too much of the plot, because watching it unfold is part of the fun. Usually you can sort of tell where a play is going or how it's going to end, but watching Deathtrap, as each scene ended, I had no idea where the next scene was going, which certainly kept me alertly watching throughout the show. 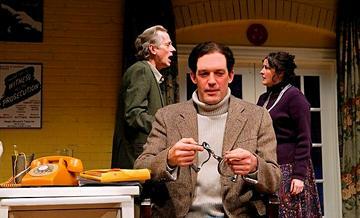 The play centers on once-great playwright Sidney Bruhl, who is desperate for another hit. When a student from his seminar sends him what could be that hit, he hints to his wife Myra that he just might be willing to kill the man to make that hit play his own. After all, he's written enough murder mysteries for the stage to be able to conduct one in reality (or so he thinks). Sidney invites the young playwright Clifford to his home, to his wife's dismay. The plan continues, but not in the way you might think. There's also a Dutch psychic (or as they called it in the late '70s, ESP), and a lawyer called in to settle some affairs. Oh just go see it, you'll find out what happens! The cast that worked together so well on Dial M last year does so here as well. Michael Booth is once again the man plotting to kill Cheryl Willis (I hope she doesn't take it personally), and both are great to watch - Michael with his deft transformation from naive innocent to something more sinister, and Cheryl with her British accent and over-the-top histrionics Steve Hendrickson steals the show with his very physical portrayal of Sidney, all loose exasperation and paranoid plotting. One of the biggest audience laughs came when he flopped around on a chair for many long minutes while Clifford typed away, unaware of the spectacle in front of him. Claudia Wilkins is a hoot as the concerned Dutch psychic ("I sense much pain, much pain! "), and Terry Hempleman (another Dial M vet) as the lawyer is the calm at the center of the storm, until he's not. All of this crazy action is beautifully directed by the Jungle's Artistic Director Bain Boehlke (with fight choreography by Peter Moore, also part of the Dial M cast). Bain also designed the set of course. As usual, the intimate stage at the Jungle houses a specific, detailed, impeccable set. This time it's a carriage house that's been converted to a writer's study. The walls are covered with posters window cards from (real and fictional) Broadway plays, scripts litter the floor under a bench, and books crowd onto huge built-in shelves. But the most impressive thing is the wall of weapons that Sidney has collected from his murder plays and elsewhere. Several of them figure prominently in the plot, and all are beautifully displayed on the wall above the fireplace. The lighting (Barry Browning, who won an Ivey for lighting Dial M last year) and sound (Sean Healey) all add to the very specific sense of time and place that is so characteristic of the Jungle's work. If you've never been to the Jungle Theater in the Uptown neighborhood of Minneapolis... what have you been doing with your life? I cannot recommend them enough. I'm always impressed by the quality of work, beginning with the sets, that are the best in town, and continuing with every other aspect, including interesting choices of plays (this summer - Urinetown the Musical!). 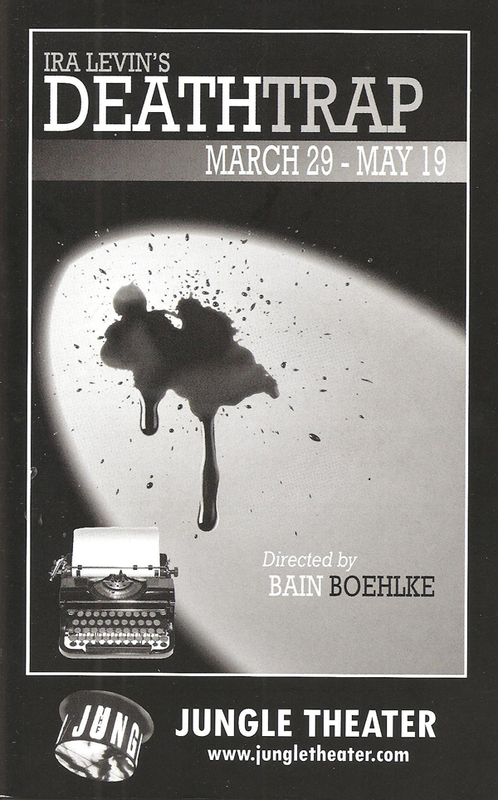 Deathtrap is delightfully fun and chilling, a play that pokes fun of the genre while paying homage to it, perfectly produced by the Jungle, as per usual (playing now through May 18).